Presentation combines both visual and textual elements. It is the way we exhibit or present our message on paper. Even if our ideas, words, and sentences are vivid, precise, and well constructed, the writing will not be inviting to read unless the guidelines of presentation are present. Some of those guidelines include: balance of white space with visuals and text, graphics, neatness, handwriting, font selection, borders, overall appearance. Think about examples of text and visual presentation in your environment. Which signs and billboards attract your attention? Why do you reach for one CD over another? All great writers are aware of the necessity of presentation, particularly technical writers who must include graphs, maps, and visual instructions along with their text. 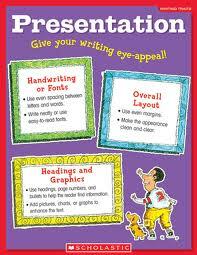 Presentation is key to a polished piece ready for publication.